My life revolves around the web. From the time I start work to the time I drag myself outside to walk my dogs, I am constantly surfing, reading, and all of the other descriptive words I could use to get the point across that I use the Internet a whole lot. One thing I learned back before Chrome’s syncing feature was that I could email or text myself links to pages that I needed while I was on the go. Addresses, restaurants, and things of that nature. Sure, it may not have been the best way or easiest by any means, but it worked. With the introduction of Chrome for Android, accessing websites from my mobile that I already had open on my desktop is now just a couple of clicks away. It saves me a lot of time and sanity when I’m on the go. For example, if I was looking up a cool spot to eat for lunch and then leave the house, but forget the name or address, I can open up Chrome and access the same exact page from my mobile that I was looking at on the desktop. The applications for the feature go way beyond that, but you get the idea. If you’re new to Chrome and are still learning about its vast features, here’s how to access the “Other devices” page from your mobile and desktop Chrome applications. As a note, you must be signed into the same Google account on your mobile and desktop Chrome browsers for the apps to properly sync together. The top image I have used are the steps you take to access tabs that are open on your desktop and other mobile devices. While you’re browsing any page, just hit the settings key and select “Other devices.” From this page, it will list which devices and computers you are signed in to with your Google account that have tabs open. Beyond just tabs, you can also access any bookmarked pages you have as well by hitting the star icon, same with popular sites you frequent. The same goes for when you’re on your desktop as well. If you have tabs open on your mobile devices that you need access to, simply open a new tab on your desktop and in the bottom right corner you will see “Other devices.” Once you hit that, you can see the other devices associated with your Google account that have tabs open such as tablets, phones, and even other computers. 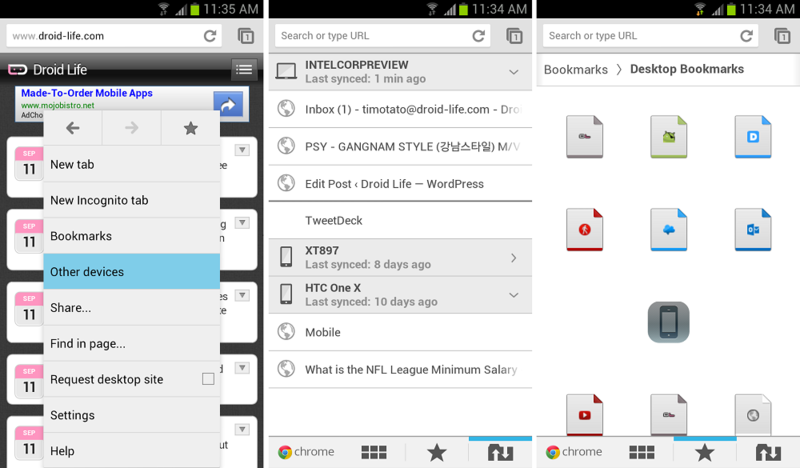 If you haven’t tried out Google’s Chrome for Android yet, you really should give it a shot. You’ll find that it is far superior in functionality and features than the stock Android or other 3rd party browser. *The rest of the Android Beginners’ Guide is a one-stop shop for all of those new to Android.